Serving communities in New Jersey including West Orange, Millburn, Chatham, and Livingston, dermatology specialist Dr. Deborah Spey sees a range of skin types—and a wide variety of cosmetic damage from sun exposure. Harsh rays can dry out the skin and contribute to early signs of aging, including wrinkles, skin laxity, and spots. They can even play a role in the formation of visible spider veins. That said, ultraviolet radiation isn’t the only enemy of youthful skin. Lack of proper hydration, environmental toxins, and more can also play a role in creating facial folds and creating a perpetual look of exhaustion and stress as opposed to relaxation and confidence. Here are five tips from Dr. Spey, all intended to let you—not the sun—truly shine this season. You will likely hear this from every dermatologist you encounter, especially when the weather is warm and people seek to spend time at the shore in shorts and without shirts: Wear sunscreen, wear sunscreen, wear sunscreen! It bears repeating, because the sun itself is relentless. It never stops beaming its ultraviolet rays to the earth, even when there are clouds in the sky. Consider that sun damage is cumulative (and can lead to health problems in addition to cosmetic ones if left unchecked), just put on sunscreen. Put it on early, and put it on often. Professional dermatology associations recommend cover any exposed skin with a healthy layer of minimum SPF 30 about 20 minutes before venturing out. Add a fresh layer every two hours, and don’t forget to replace any sunscreen that gets washed away by seawater, the pool, or healthy amounts of sweat. Not only will the protection lower your risk of skin cancer, it will also cut down on damage to the hyaluronic acid, collagen, and elastin that give your skin its softness, smoothness, and resilience. Yes, sunscreen is vital, but you can also give your skin further protection by staying in the shade. Choose to picnic under a tree, put an umbrella or pop-up over you at the shore, or decide to wear pants and long sleeves if the weather allows it. If you’re outside, though, don’t leave off the sunscreen on your still-visible areas. 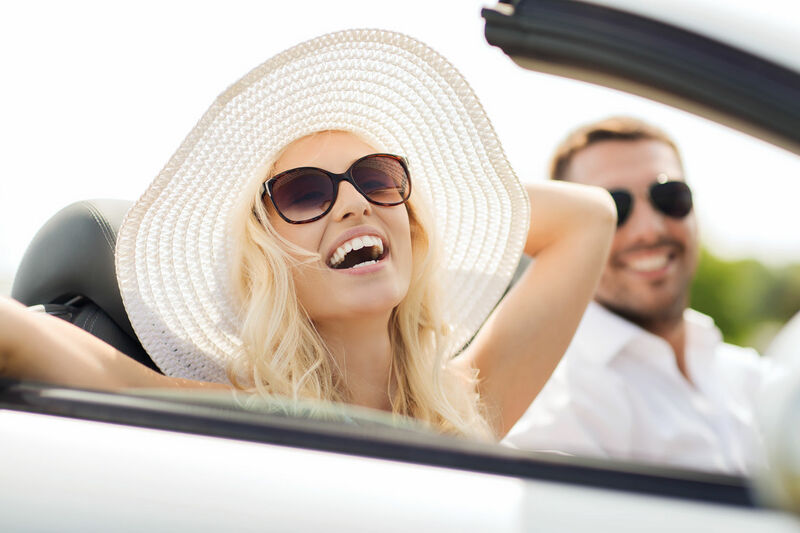 Be particularly aware of time spent in cars, as this is a major contributor to ultraviolet radiation exposure. Summertime is known for its lemonade, ice tea, and cold adult beverages, but the best liquid you can have on hand is a simple glass (or six) of water. Well-hydrated skin takes its moisture from the inside, so don’t think lounging all day in the deep end will keep you from drying out. In fact, soaking all day in a backyard or public pool can have the opposite effect, especially if chlorine and other harsh chemicals are used. Keep your skin happy and healthy by always having water on tap. Summer can be a month of nonstop activity in harsh conditions, running from the kids’ swim lessons to the evening barbecue before packing for a vacation in the mountains. It may be tempting to avoid the bed for as long as possible in the midst of all this busy-ness, but sleep is a vital factor in skin health. Everything from wound healing to replenishing broken-down skin components happens while you dream and doze, so be sure to schedule some shut-eye, too. Who better is there to give skin advice than a skin-focused doctor? As a professional, a dermatologist knows what it takes to keep skin looking healthy and youthful, no matter the season. More than someone ready to help fade a sunspot, dermatologists can give personalized advice on how to treat unique skin conditions, as well as minimize or even prevent future cosmetic problems. That said, don’t put off addressing a bit of hyperpigmentation if it’s bothering you. The same goes for wrinkles, lines, and even a double chin. Qualified dermatologists are typically equipped with everything from wrinkle-smoothing BOTOX® to fat-busting Kybella® to give patients the look they want without surgery. Have a summer sun-related question or want to know more in general about dermatology? Contact Dr. Deborah Spey’s practice, Advanced Dermatology & Skin Care, in South Jersey by calling 973.731.9600 or visiting www.drspey.com. Are you a parent, and wondering if your son or daughter is abusing heroin? Here are some warning signs to look out for.